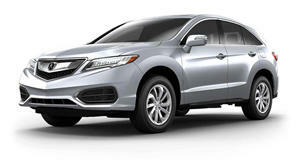 All-new RDX gets 2.0-liter VTEC turbocharged engine and A-Spec variant. Acura isn’t wasting time with the all-new 2019 RDX. After revealing the , Honda’s luxury brand will bring an example wearing production sheet metal to the New York Auto Show later this March. The 2019 Acura RDX goes back to its roots, powered by a new 2.0-liter VTEC turbocharged four-cylinder engine sending power to the pavement via the brand’s Super-Handling All-Wheel-Drive system. Acura didn’t detail specifics for the 2.0-liter turbo engine, but expect output to be similar to that of the —252 horsepower at 6,500 rpm and 273 lb-ft of torque between 1,500 and 4,000 rpm. The RDX’s 10-speed automatic—a segment first—will likely offer the same paddle shifters as the Accord, too. Acura claims the 2019 RDX is the “most extensive Acura redesign in more than a decade,” which it says will set the tone for “a new era” for the brand. Its exterior will likely wear near identical sheet metal to that of the RDX Prototype, and probably the same interior, too. Acura calls it “Precision Cockpit” and it includes the brand’s True Touchpad Interface. Like other Acuras of late, the RDX is expected to gain an A-Spec variant toward the top of its trim range. While Acura didn't specify how the A-Spec model will differ from other RDXs, don't expect more power or performance as the brand has generally limited A-Spec modifications to visual enhancements. Instead, any additional performance would likely arrive in the form of , which could bring with it a newly developed V6 engine. The 2019 Acura RDX is an all-American affair, designed by the folks at Acura Design Studio in Los Angeles, California, and developed by engineers in Raymond, Ohio. The third-generation SUV will go on sale later this year.